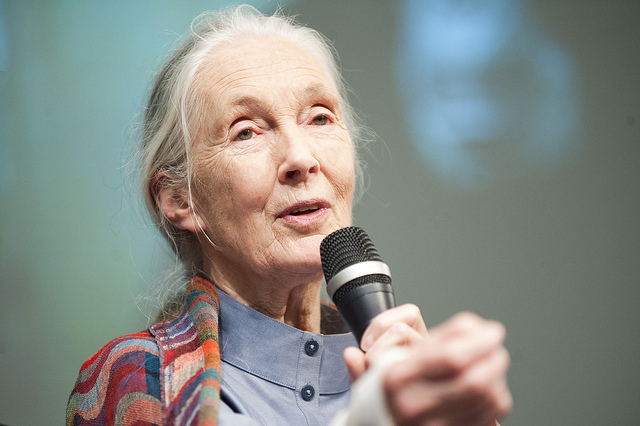 Today is Jane Goodall’s 80th Birthday! I wanted to write a special post for that .. for her, but I really couldn’t imagine what I’d say that hasn’t been said a thousand times before. I did pay tribute to her in 2011, and I encourage you to go read that post on this occasion. Happy Birthday Dr. Goodall and thank you for everything — your spark, your compassion, and your tireless work on behalf of chimpanzees in the wild and in captivity. What I am really saying is thank you for setting such a fine example as a scientist, a communicator, a humanitarian and a steward of this earth. By being the change you want to see in the world, you have truly shown us what it means to be human. The other presenter I remember was a tiny blonde woman with a soft English accent. She came to the podium, the lights dimmed, the film started, and she began to talk. And I was in love. On screen was a family of chimpanzees. At the podium, of course, was Jane Goodall. Jane (she wasn’t Dr. or Dame Goodall then) was fresh from Gombe Stream Reserve and she introduced us to all the animals whose names many of us can still recite: Flo, the Grande Dame; her children, Faben, Figan, Fifi, Flame, and Flint. Melissa and her children, Goblin and Gremlin. And of course, David Greybeard. Then, after introducing them, she quietly told us the stories of their lives. I was 14 years old. And captivated. Now click on over and read more about my first encounter with Jane Goodall and how she influenced the course of my life.